After the disaster that was last week's SPL predictions I'm hoping for a turnaround this week. Four draws last week including both sides of the Old Firm. Who'd have thought it? So this week. Mixed fortunes in Europe for Glasgow's ugly sisters on the back of dropped SPL points last weekend. More of the same this week? Jim Jefferies will be looking to bounce back after a disappointing defeat at Tynecastle last week. 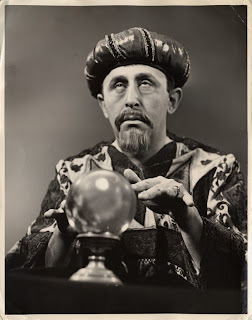 How motivated his players will be following his "Kevin Kyle plus ten" comments about team selection remains to be seen. Rangers will be looking to build on the one good half of football they've played in the last two games. Expect a Rangers win. And don't bet against Kris Boyd coming off the bench to score. Both sides drew last week with the Dons' point at Falkirk coming after the sort of game that makes Setanta's slide into bankruptcy easy to understand. Mark McGhee is unlikely to welcome back his prodigal Sone but dropping Aluko from the squad won't help the team's mini goal drought. St Mirren will be looking to pick up another away win as they await their first home victory at their new ground. A draw. With few goals. After maintaining their undefeated records against the Old Firm last weekend this might just be the first key clash in the battle for third place. That might turn out to be a premature assessment but this still ranks as pick of the day. I'm giving United the win thanks to home advantage but a draw would not surprise me. After Hamilton won last Falkirk are the only SPL side still waiting for a win. The draw against Aberdeen showed signs of resoluteness but Hamilton are enjoying the confidence boost after their win over Hibs last week. You would expect these teams to be evenly matched and, even at this stage, this will be a tense affair. Another draw. Again without many goals. Last week Hibs looked more anaemic than Derek Riordan after a long hard night of not getting in to Edinburgh's nightclubs. To say John Hughes will have been putting them through their paces this week would be an understatement. St Johnstone felt they could have got more than a point against St Mirren last week and would we see an away win over Hibs as a moderately sized scalp. Expect Yogi's week of terror to have had an impact though. Home win. It's fair to say that a sizable chunk of the Celtic support did not take too kindly to Thursday's capitulation in Israel and Celtic will be searching for forgiveness on Sunday. These sides have produced crackers in the recent past and Hearts have the boost of Tuesday's win as they arrive at Parkhead. I'd expect Celtic to steady the ship though. Home win, by at least a couple of goals. Well, I’m on a roll so why not. If a country gets the TV it deserves then we are a very bad bunch here in Scotland. Let's leave BBC Scotland out of this for just now (although a lot could be said, right Chick?) and concentrate on the excuse for a modern broadcaster that is STV. With terrible programmes and terrible presenters (I wouldn't wish an hour with Stephen Jardine on my worst enemy) the channel has long been in the doldrums. But last night's inability to show the Rangers game was insulting to Scottish football and, once more, displayed STV's inability to provide a service for their viewers. I’m sure not everyone will agree but I think the Scottish representatives in Europe’s top tournament should be shown on terrestrial TV. And I speak as someone who has laughed long and hard at some of the drubbings handed out to the Ibrox side over the years. This year we'll not get one Rangers group match. Not a single one. Instead we get Liverpool. It was definitely Scottish though and we had a Scottish presenter (backed with an English pundit) to prove it. 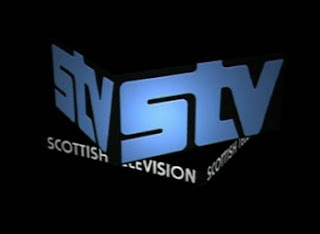 STV are blaming ITV for failing to negotiate the correct deal with UEFA. This is a bit rich as STV are currently falling over themselves to not show anything from ITV and are instead devoted to an output seemingly designed to appeal to nobody apart from a few sheep on Skye. Apart from some highlights of rugby’s Magner’s League STV have shown themselves to have absolutely no commitment to Scottish sport. At the same time they are denying Scottish viewers the right to watch programmes that are freely available in Berwick, Leeds, Belfast and Cardiff. If they can't provide the service that viewers want, if they are financially incapable of showing live football with Scottish teams then they should stand aside and let another broadcaster take over. Because right now the fabled potter's wheel would beat anything that STV can make. Perhaps we’re on the road to independence and perhaps not. If we are then Alex Salmond should be stepping in. If STV is going to be the national broadcaster of an independent Scotland then the time to run for the (English) hills has already arrived. Another season, another incarnation. The Europa League proper kicks off tonight for the first time. What is it now? Basically the Champion’s League-lite. Having used the behemothic blue riband event to strip the UEFA Cup of whatever lustre it once had UEFA have come up with the Europa League as a way of breathing life into their second tier event. That actually sounds a bit too nice on UEFA. They’ve created the Europa League to get more money out of games featuring clubs that aren’t good enough to play in the Champion’s League. This season those teams include some names with illustrious European reputations slumming it either because their glory nights have disappeared into the distant past or they are trapped in leagues that don’t support multiple Champion’s League entries. And among those number we must place our very own Celtic. Or Glasgow Celtic as they will no doubt be known for the duration of their involvement. They kick off tonight in Israel where Hapoel Tel-Aviv provide the competition. Not, one would imagine, the easiest of trips but Tony Mowbray will be seeking the salvation of a Europa League run so he’ll be keen to hit the ground running. I must admit that the Europa League doesn’t really interest me in the slightest at the moment. Maybe it will grow on me. The UEFA Cup was steadily watered down over the years and the league format of the last few years seemed a desperate move. Which was fitting as it produced only a succession of desperate games. Maybe the Europa League will spark some life into the competition and maybe not. 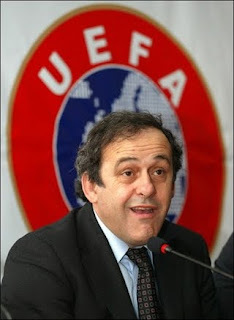 I’d not bet my house on Platini’s Pillocks having found the winning formula though. Hmm. Now, you might think that a referee, two linesmen and a fourth official should be able to manage things themselves. If they can’t then there’s every chance that adding another two will simply increase the crew of incompetents from four to six. But maybe it will work and maybe the referees will appreciate the help. I’m keen to see if they’re also there to flag for things like obstruction when a defender shepherds the ball out of play and shirt pulling and general "jostling" at set pieces. These are normally ignored at the moment. Clearly, if illegal, they should be clamped down on but to do it every time is really going to interrupt the flow of the game. I’m not yet convinced by the use of technology during games but if debates about the ball crossing the line are common enough to demand two extra pairs of eyes then surely we could come up with some kind of unobtrusive technology to do the job. In fact I’m sure a Higher Physics class could come up with something that would get the job done. I am intrigued by the experiment but I’m not convinced that it’s really needed or that it will work. And I’ll leave you with this thought – positioning is all important. Take Eduardo and the most famous dive since Greg Louganis stuck the heid on the highboard. If you were standing at certain places behind the goal that night then you’d have been as blind as the referee, traditional linesmen and Arsene Wenger himself. That, you might think, would render this experiment redundant before it’s even started. Today's Guardian offered a rare treat: A full copy of the much missed football weekly Roy of the Rovers. I felt quite nostalgic going to the newsagent to buy it. Although, being frightfully middle class, my comics were delivered so I never actually had to go to the shop for real when I was younger. This was not, you understand, a new copy (that would be less fun, what with Roy's leg amputation and his move away from the mighty Melchester) but a reprint of the issue from 19th December 1981. Wayward striker Vic Guthrie finds Roy slumped over his desk. Is Guthrie himself a suspect after major fallouts with his famous player-manager. On discovering that his most iconic employee has been shot in the head Melchester Rovers' general manager Ben Galloway asks: "What, you're treating this as attempted murder?" Ben, a fine servant of the club, shows himself to be a bit slow on the uptake here suggesting he would have struggled in the Premiership era. Sadly the reprint is a one off. And we leave Roy in a coma, his best friend - and equally enduring - Blackie Gray installed as manager and no further clues as to the perpetrator. Sir Alf insists he'll walk away as soon as Roy as fit but in the meantime returns prime suspect Vic Guthrie to the starting line up. In February 1982 Roy has still not regained consciousness. In his absence Sir Alf adopts a revolutionary new attacking formation. As Rovers go one ahead the whole crowd starts to chant the name "Roy Race" - the wall of sound even stopping the players in their tracks! In the hospital the radio in Roy's room is tuned to the match. Incredibly, if somewhat predictably, the chants get through and Roy opens his eyes. Racey is back. Rovers go on to win the game 14-0, thus breaking the league record and vindicating Sir Alf's new tactics (although with Rovers unbeaten in 20 league games the change seemed slightly redundant). By April 1982 Roy is back as manager and Sir Alf departs stage left. But the murderer is still at large. A month later, however, after scoring two goals on his return to the team Roy subs himself at half time and "Races" to the nearest police station. There he informs the local cops that his killer was the actor Elton Blake. After losing out on the biggest job of his career - playing, you've guessed it, Roy Race - Blake had sworn revenge. As ever Roy was to defeat him in the end. 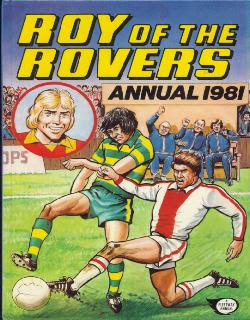 Reading it now Roy of the Rovers is a relic. Transport yourself back and you can understand why you were so beguiled. The tributes to Roy from luminaries such as Morecambe and Wise are the key. Everyone knew it wasn't real life but everyone was prepared to go along for the ride long enough to allow you to suspend your disbelief. It gave the magazine a magical quality at the time. But you can also see how irrelevant it would be to its target audience now. A shame really. But we'll always have nostalgia. Want to read more? I can recommend Roy of the Rovers - The Playing Years and you might also like Roy of the Rovers - The Unathorised Biography which is reviewed here. I wrote last week that it would take more than sacking George Burley to spark a sustained upturn in Scotland's fortunes. I thought I was witnessing Govan's next superstar on a Renfrewshire football pitch 10 years ago. 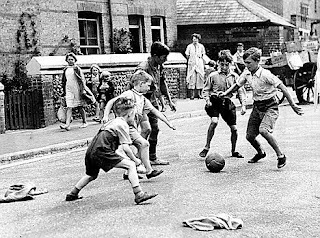 He could only have been nine and the ball was a precious thing to him as he cajoled it away from throngs of opposition players; sometimes with his left foot, sometimes with his right. 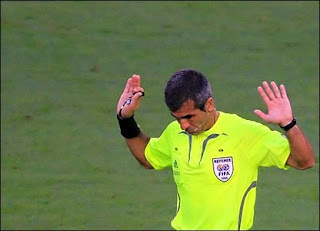 He was the quickest player on the pitch, yet didn't seem to be expending any more energy than the hapless others. And he had a sinewy physical strength that allowed him to negotiate tackles that began to grow more raw and industrial as the game reached its conclusion.